Let us find the perfect plate for you or a loved one. Simply fill in the form below and we will email you the possibilities. Celebrate that important date with a personalised plate. Regtransfers has a range of great date registrations. A number plate representing a birthday is a great gift choice. We find that many customers buy date plates for themselves, so it's a fair bet that a plate bearing your loved one's date of birth will be a welcome present. Date plates can also be less expensive than many name numbers, so they tend to fall within more people's budgets. The number representing the date may be combined with letters to display the owner's initials. A fantastic way to personalise a car, and you can be sure that the recipient of such a gift will never again forget their registration number! Don't forget, date plates can be meaningful in many other ways too. Wedding anniversaries, establishment of businesses, historical events: all of these and more can be represented on a vehicle number plate. If you need more ideas, get inspiration from our other themed searches. 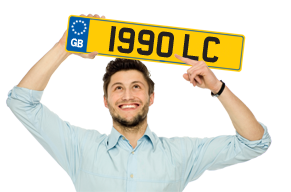 Our page on car registrations formats explains how to understand prefix, suffix and current-style number plate layouts.